KUALA LUMPUR (Jan 7): Based on corporate announcements and newsflow today, companies that may be in focus tomorrow (Thursday, Jan 8) could include the following: Mah Sing Group Bhd, Puncak Niaga Holdings Bhd, Scomi Energy Services Bhd, Pesona Metro Holdings Bhd, Eng Kah Corp Bhd, Poh Huat Resources Holdings Bhd, MyEG Services Bhd and Reach Energy Bhd. Mah Sing Group Bhd expects to post higher sales this year, driven by pipeline launches worth RM5.96 billion in gross development value (GDV). "We are targeting a minimum of RM3.43 billion in sales in 2015, same as the amount of sales in 2014, but of course, we are aiming to do better," its group managing director and chief executive officer Tan Sri Leong Hoy Kum told a press conference, after the group's extraordinary general meeting (EGM) today. New launches will come from its Bandar Meridin East township in Iskandar, Johor Bahru; M Residence 3 in Rawang, Selangor; Icon Residence in Georgetown, Penang; and Star Residence in Subang Bestari, Selangor. The launches have a combined GDV of RM5.96 billion. Puncak Niaga Holdings Bhd is eyeing Asean countries as potential markets to expand its water and environment engineering business, which will remain as its core business, after the disposal of water assets to the Selangor government. At the same time, the group is looking at diversifying into the plantation sector, while upping its investment in the oil and gas business, said executive chairman Tan Sri Rozali Ismail, after the extraordinary general meeting today. The group is in talks with several Asean countries to provide "total water solution" in water treatment and distribution in the countries, Rozali added. Scomi Energy Services Bhd has bagged a contract worth RM175.4 million from TNB Fuel Services Sdn Bhd (TNBF), a wholly-owned subsidiary of Tenaga Nasional Bhd, to carry bulk coal. In a statement this evening, Scomi Energy said the contract is for a period of two years, commencing May 1 this year, with an option for TNBF to extend it for another year. Under the contract, the company is expected to transport approximately 1.2 million tonnes of coal per year. "The growth in the bulk carrier segment of Scomi Energy’s business will provide the company with recurring revenue, that will help us weather the current challenging landscape in the oil and gas (O&G) business," said Scomi Energy chief executive officer Shah Hakim Zain. Pesona Metro Holdings Bhd is targeting 8% to 10% revenue growth this year, despite a “tougher” construction market, which will see its profit margin “a little squeezed”. The construction firm saw a 4.7% decline in revenue to RM205.86 million, for the nine months ended Sept 30, 2014 (9MFY14), from RM215.91 million a year ago. Net profit plunged by more than half to RM5 million, from RM11.66 million in 9MFY13. Pesona Metro chairman Datuk Lee Tuck Fook said it is looking to diversify its earnings to reduce its dependency on the construction sector, by looking towards a base of recurring income to bring stability to its earnings. “A number of M&A opportunities have also been presented to us, which we are currently evaluating and will put forward to our shareholders, as soon as we have completed our evaluation,” Lee told reporters, after the company’s extraordinary general meeting today. Pesona Metro currently has an order book size of RM500 million, and a tender book of over RM1 billion. Eng Kah Corp Bhd, which produces cosmetics and beauty products, expects two major OEM deals in Australia and the United Kingdom (UK), which it hopes to ink by year-end, to contribute 20% to group revenue in the financial year ending Dec 31, 2015 (FY15). Its chairman and managing director Ewe Eng Kah told reporters today after the group's EGM, that Eng Kah is in the final stages of discussion with a major chain store company in Australia, and a leading pharmaceutical brand in the UK. Eng Kah is the largest contract manufacturer of toiletries and household products in the country, having US beauty retailer Avon Products Inc, Kimberly Clark Corporation and Cosway (M) Sdn Bhd as its clients. Poh Huat Resources Holdings Bhd’s share price rose to an all-time high today, due to the weakening of ringgit. At market close today, shares of the wood-based furniture manufacturer rose 11% or 15 sen to an RM1.73, with some 1.76 million shares traded. A company spokesperson who did not want to be named, said Poh Huat should see 30-40% gains in turnover, purely based on the currency gains alone. “The weakening of ringgit is the major cause behind the rise of the share price,” he said. Likewise, MyEG Services Bhd also saw its share price hit record high, having gained 43 sen or 10.1% to close at RM4.70, after news the e-government service provider would work with the Immigration department to compile and maintain the database of foreign workers in the country. The counter rose to an intra-day high of RM4.76 in the afternoon trading session, but eased to close at RM4.70, with a market capitalisation of RM2.82 billion. Some 4.66 million shares were transacted today. According to news report, the government will require employers to register details of their foreign employees, through MyEG’s Foreign Worker Permit Renewal (FWPR) services, starting this year. 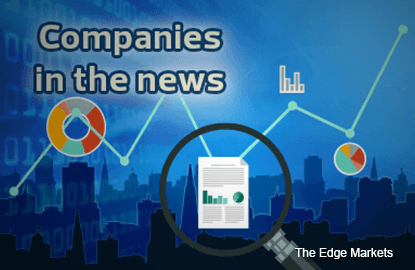 Meanwhile, Reach Energy Bhd chief executive officer (CEO) Shahul Hamid Mohd Ismail has recently acquired more shares in the oil and gas special purpose acquisition company (SPAC), via open market trades. In a filing with Bursa Malaysia today, it was revealed Shahul had acquired a total of 516,000 shares, representing a 0.04% direct stake in the company, on Jan 5 and Jan 6, 2015, at 60 sen each.